View of the falls from the rope-way. View from the walkway platform. A GUEST POST by my sister Aparna. We recently shifted to Jabalpur, Madhya Pradesh, and the last week of September gave us our first free Sunday. It was a warm sunny day and we decided to head out to Dhuandhaar waterfalls. 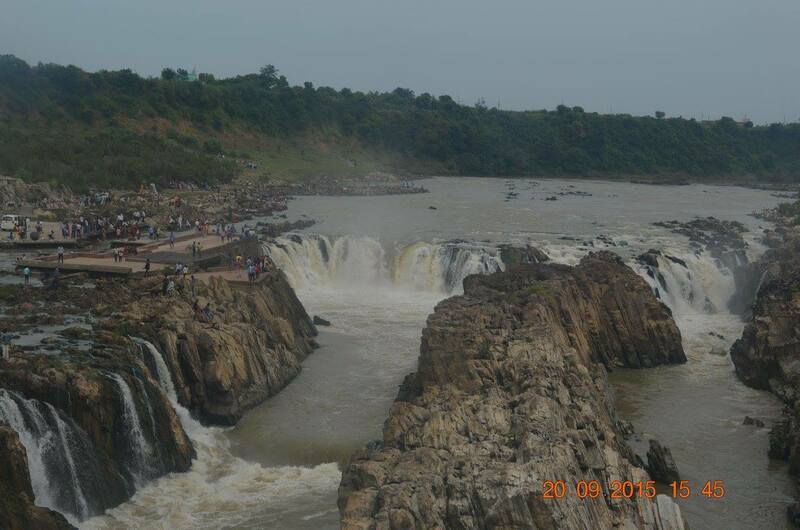 Known for its misty vapor and loud sounds, this waterfall is formed by the mighty Narmada river. 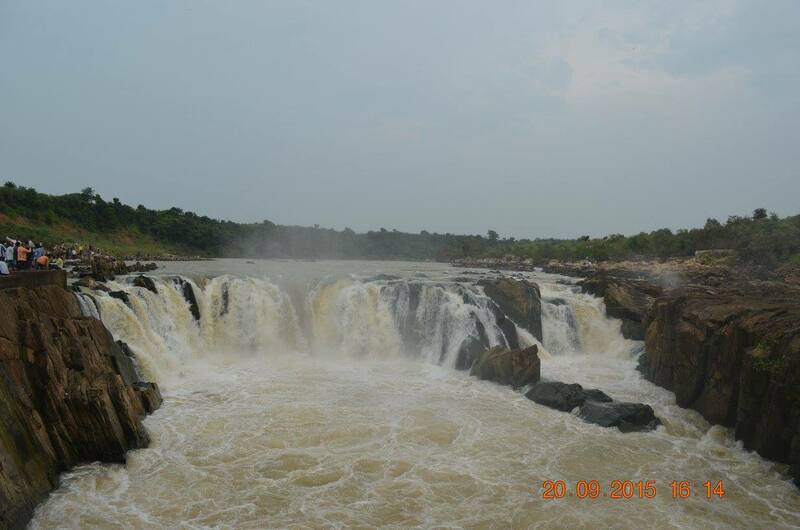 It is located 15 kms to the south west of Jabalpur. We left at 11 am after having a quick breakfast of Yippee (Maggi was still banned then). Unfortunately, Google Maps guided us on a different route, and we ended up on the opposite side of the falls! The waterfall is slightly deceiving. One doesn’t see or hear anything till one is very close. It also isn’t very high, but Narmada flows with a lot of force, generating sprays of water. After enjoying the breath-taking sights, we had lunch of Punjabi food at Vrundavan restaurant, which had tables set out in the garden overlooking the falls. Next we boarded the rope-way to cross over. The entire falls were visible from up there. On reaching the other side, we encountered throngs of people. We joined them in taking in a beautiful view from the observation platform. We went ahead a bit and saw the marble rocks, for which Jabalpur is famed for. Due to monsoons, boating in Narmada which flows through these rocks, was closed. We spent some time looking at the small shops selling marble items. 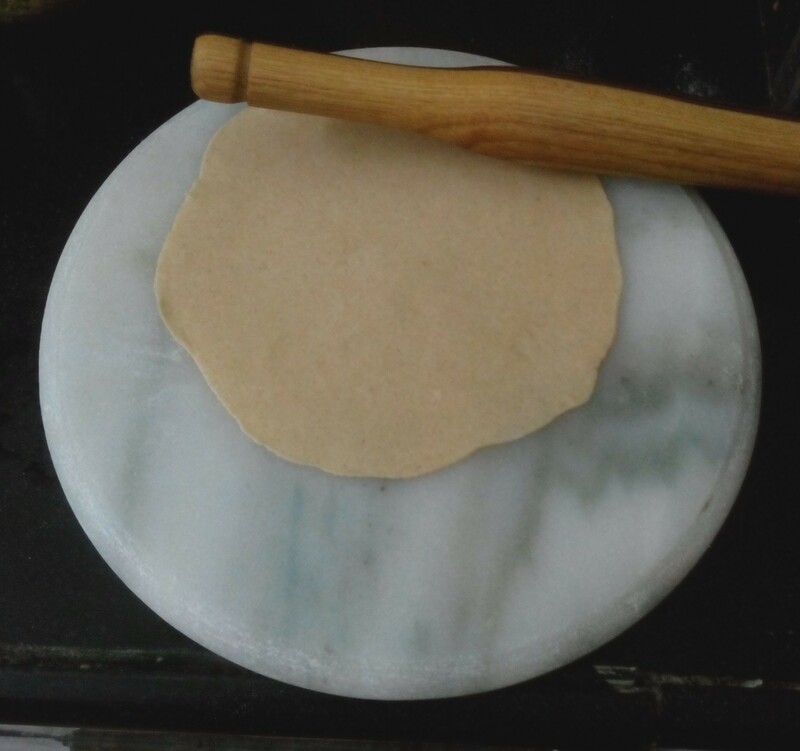 Bought a chakla (a roti making platform). After a while, tired from all the roaming, we freshened ourselves with sugar-cane juice. With the sun setting, it was time to go back. We took to the road and reached home at 6 pm. 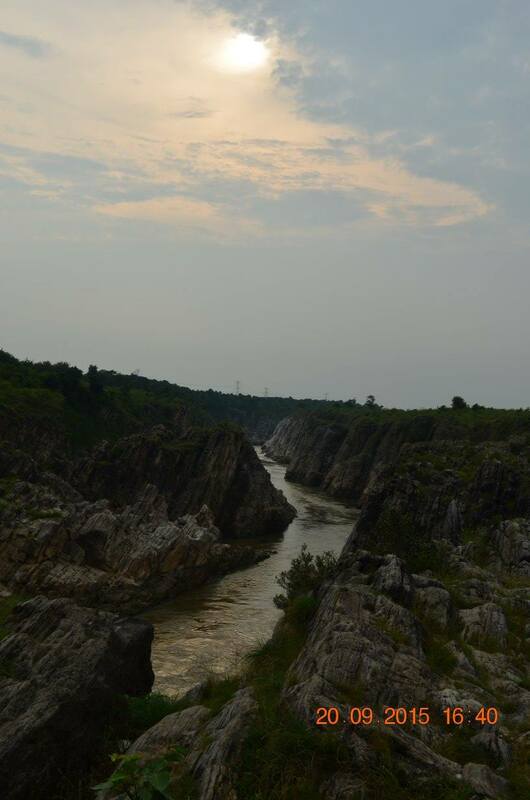 Narmada flowing through the marble rocks. As always, reading your post is same as Sunday well spent. Beautiful photos and nice write uo too!